I had very high hopes for a recent konadicure. I really did. I combined many of my favorite things: China Glaze For Audrey, China Glaze OMG, and cute characters. Sadly, not all experiments wind up with awesome results and this was one of those times. Here is a photo of a sad nail job that I could only handle for 3 days. Maybe it looks okay in the photo but trust me, it had bedsheet texture pressed into it from a crappy top coat (*hiss*revlontopspeed*hiss*) and I was just very disappointed. IT HAD SO MUCH POTENTIAL! Miserable failure! SOOOOOOOO, obviously I have been VERY anxiously awaiting the arrival of my box of ZOYA polishes from the recent polish exchange and was crazy excited to find the shipping box placed on my chair when I got home yesterday. I (carefully) thrashed around the contents and revealed these beauties. Some close-ups to appreciate the sparkly, glowy, shiny awesomeness. 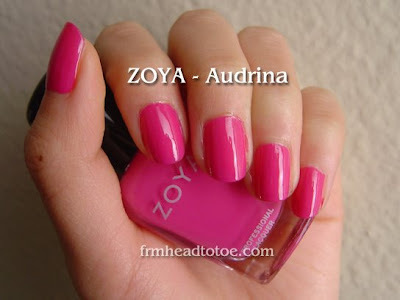 Of course, my impatient self had to try out one of the more intriguing colors, Audrina. She is a lovely, 50's pin-up style fuscia cream. There is a berry-ness that is missing from the photos and I don't know if it's just my camera, but it is GORGEOUS on the nails. Has anyone tried those sweet plum hard candies from the Asian supermarket with the pink wave in it? If that taste could be made into a polish, it would be this one. I'm almost disappointed that these came out more hot-pink here than in real life. It has a purpley kick that makes it really special. You can kind of see the purple a bit more here in my konadicure. Looks like tire tracks on my tips, no? Very rockstar. I love it. Also, SOO much glossier with my Sally Hansen Insta-Dry topcoat! Let me tell you, it wasn't just the color that wowed me. The consistency was fantastic. Thin but not watery or streaky. This was perfect in 2 coats and I am a serial 3 coater. I don't know how they got so spot on while being "big 3 free" (aka better for the environment) but they succeeded with flying colors. I'm a Zoya convert! I can't wait to test the other colors and see how they compare to Audrina. Just to let you guys know, the current Zoya exchange has been extended through June 1st under the premise of "going green" for Earth Day. If you missed the first time around, you still have plenty of time to check these out. I also wanted to mention that Cherryculture.com is having free shipping through today (march 10-12) and I just discovered flaky topcoats from their NYX polishes! I ordered Peach Ave and Purple Ave as well as Jungle and a couple more NYX single eyeshadows. Definitely try them if you haven't yet, they are my fav. I wish I knew how to do konadcures. i think your mani's are so cute :) at least they LOOK ok.. mine get dented and i don't know HOW.. hahaha man. i don't know why i bother putting on polish. your new zoyas look great though :) i want to see more swatches! Your nails in the first pic are soo cute, I love it. Oh yeah, that's also a pretty pink plum color too. My boyfriend just bought me a peach air freshener for my car and I swear to God, it smells EXACTLY like those candies. The little animals(or are they supposed to be people?) are so cute! 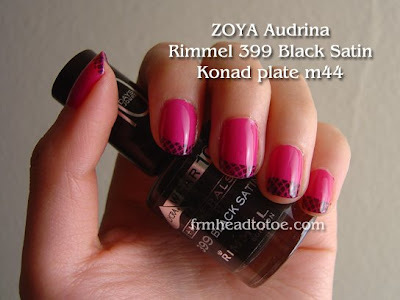 I was just wondering, where did you order your konad nail art set? P.S. Hehe I was surprised to discover that Konad is a Korean company! Go figure lol. AND they have skincare products, which I'm highly interested in...just need to figure out how/where to buy them! oops! I forgot to ask you which Konad set you bought because I am thinking of getting Set A. What do you recommend? oh! and I found another site that sells it too! btw i saw a post made by you on soompi sometime from january stating your current skin routine, and i saw that you wrote "moisturize with dove" before "apply duac" or something like that. since im on prescription as well..i wasn't sure if you applied your moisturizer BEFORE applying the acne meds? or should i apply the meds first then moisturizer? currently im applying meds first but i wasn't sure if it's better to moisturizer first..? oh i also had another question, this time bout the Doxycycline. i saw u wrote that you're on both doxy and Yaz. I know that my Doxy makes me throw up as a side effect if taken at the wrong time, or if i dun eat something an hour before, etc. do you think the Yaz is "healthier" per se to use than the Doxy? I have been on BC pills before, particularly this Yasmine one (when i was on accutane a while back) and so I wasn't sure if it was better to do BC pills than Doxy. I know you stated you've only been taking yaz for 1 month but i still would love to hear how you personally feel about it now. Caroline: I actually bought my Konad stuff from ebay and got "fauxnad" plates on purpose! It was much cheaper and they were the same style plates as on the Konad site. I just checked and the person I bought it from doesn't seem to have any nail plate auctions up right now. Usually, sellers of plates have stamps and scrapers they can send you with an order. Or, you can just buy a real Konad one. It works too. Since I haven't ordered from any of those websites I can't really give good advice! But if you do order from there, let me know how it goes, ok? IchigoBunny: You must have been looking at a REALLY OLD post. I haven't taken any antibiotics for around a year. Some antibiotics make birth control less effective and I needed the birth control to be effective since I got married last June! YAZ is the only oral medication I take. I wouldn't say take the antibiotics OR the birth control... they do totally different things and I can't say what would work or be best for you. You'll need to talk to your doctor. Ask them about all of your options. In my opinion, it's always easier and better for your body to take less pills vs. more. Oh, and yes I moisturize right after I wash my face, before I apply any other topical things. Hope that helps! but thanks so much for answering me. ill try out moisturizing before i put on the topical gels to see if that helps. oh wow, i like how you did your nails on the first photo :) nice! im scared to leave the house now w/o these tapes so i havent really experimented with the permanence of these tapes..but i've gone about 3 days with a crease w/o tape before. i just wanna know when you can be sure that its a permanent crease, like does it just appear one day? does it feel different from all the other days? Anonymous 2: Mine aren't permanent yet so I'm not sure! One thing you can do is to wear them at night while you sleep...that way you are still wearing them in between having the crease during the day. One friend of mine just puts them on for around an hour in the morning and it stays all day for her. Good luck! Rachel: I actually have clean nails as we speak so I will try to swatch the colors I got tonight.